Makati City was once a town remote from Manila. It was so out of the way that the first airstrip in the country was located here. What is now the Ayala Triangle, the very centre of the business district, was once the runway for the Nielson Airport (this building still stands and is now the Filipinas Heritage Library). 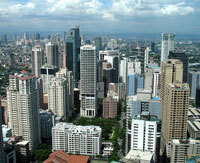 Makati has Metro Manila’s central business district, with its major banks and many corporate headquarters. This is where the Philippines’ business world connects to the international business world. The country’s most exclusive residential gated suburban communities are only 10 minutes’ drive from its high-rise office towers, which makes Makati enormously convenient, for the rich. Makati’s exclusive “villages” (in reality, gated suburban areas) are where many of Manila's affluent families and expatriates live. Politicians, senior corporate figures, diplomats, multilateral bankers, and senior employees of international companies live in large homes that line wide, quiet avenues shaded by beautiful old acacia trees. Cars move slowly and quietly, in happy contrast to the chaos outside. 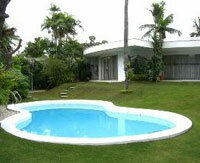 Lawns and swimming pools are discreetly tucked away behind the houses. These neighbourhoods are hidden behind tall, ugly, often unpainted walls. The casual visitor might never have any idea that they even exist. Yet they occupy perhaps half the central business area. Access is restricted to those who have gate passes—no ID, no entry. Inside are some of the city’s lushest and greenest residential areas. Six of the 7 villages (Urdaneta, Bel-Air, Dasmariñas, Magallanes, North Forbes, South Forbes, with the exception of San Lorenzo) are all interconnected, allowing car-owners with a pass to enter all, by passing Makati’s rush-hour traffic jams. In contrast to life in these villages, the poorer residents of the city live in the grungy peripheries of Makati, toward the Pasig River and other outlying areas. In search of better opportunities, people from the provinces sometimes end up squatting in the area. Though rich and poor live side by side, in truth there is very little interaction, except on the level of paid services. North Forbes and South Forbes, first developed in 1948, are perhaps the most exclusive residential villages. The almost similarly exclusive Dasmariñas Village located just at the periphery of South Forbes was built in the 1960s. 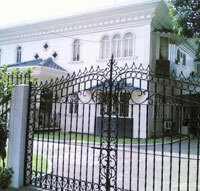 Other gated subdivisions nearer the central business district are San Lorenzo Village, Urdaneta Village, Bel-Air Village, and Magallanes Village. North Forbes has the largest and most splendid houses. South Forbes has many similarly large homes, and is quieter and more extensive, perhaps the nicest gated village in the Philippines. The houses in Dasmariñas are typically somewhat smaller, but this village is also wonderfully quiet, green, and pleasant. Magallanes is similar to Dasmariñas, but less expensive because it is much less conveniently located. Urdaneta and Bel Air are the most “inner” villages; Bel Air is now much in demand because of the presence nearly of the exclusive Rockwell mall. There are many luxury high-rise residential condominiums within the Makati Central Business District, particularly in Legaspi Village and Salcedo Village which, to complicate matters, are not exclusive villages, but mixed-use districts. Salcedo Village was originally intended as purely residential, while Legaspi Village was intended to be commercial, But the developers realized that this was a mistake, and as commerce, entertainment, and residence have mingled, these areas’ vibrancy has increased. What began an area with pockets of commercial establishments and business offices in the ’60s and ’70s has become the biggest and busiest commercial and business centre in the country. The Makati Central Business District, or CBD, is bounded by Senator Gil Puyat Avenue (formerly Buendia Avenue), Makati Avenue, Ayala Avenue, Arnaiz Avenue (formerly Pasay Road), and Pasong Tamo. It includes Legaspi Village and Salcedo Village, areas that are partly residential but also include many office buildings alongside high-rise condominiums. A raised walkway connects much of Legaspi Village with Greenbelt Park and the Ayala Centre, making it easy for residents to walk from home to workplace or to the shopping and recreational areas. The Makati skyline has changed drastically from the 5-storey buildings of the past to today's skyscrapers of over 30 storeys, many of which are stylish new luxury condominiums. 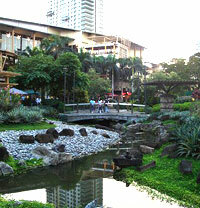 Although in central Makati buildings often stand side by side, pockets of green can still be found. The most notable one is the pleasant Greenbelt Park at the centre of the vibrant and enormously successful Greenbelt complex, which mingles restaurants, shops, cafes, a museum, a park, in an aesthetically successful arrangement. Like most of Makati, this complex was built, designed and maintained by the country’s leading business group, Ayala Land, controlled by the Zobel family. Most residents of the CBD live in apartments or condominiums, but there are some nearby gated subdivisions such as San Lorenzo Village just across from Ayala Centre. The Makati CBD is a highly accessible area, as it is located beside EDSA and close to the South Super-Highway. There is an MRT station at Ayala Avenue. Ayala Avenue is the CBD's main thoroughfare, lined with many high-rise office buildings, and some hotels and condominiums. The Makati CBD is closely associated with Ayala Avenue; in fact, many locals say "Ayala" (or even "Ayala Centre") when they mean the CBD (a term that's not in popular use). Most people just call it plain "Makati," ignoring the existence of the greater Makati area beyond the CBD. Ayala Centre Makati is a sprawling shopping and recreational area that includes several department stores and malls, hotels, the Greenbelt Park, and the Ayala Museum. Ayala Centre and the neighbouring Legaspi Village have numerous clubs and bars where DJs and live bands perform every night. On the whole, though, central Makati has a family-friendly vibe; there is not much of an "alternative" scene in this area. It is a good for dining out, as there are many restaurants offering a multitude of cuisines; the restaurant row along Greenbelt 2 is especially good for fine wine and dining. Another restaurant hub is just beside Bel Air Village. Those seeking fresh produce can shop at the popular market held in Salcedo Village on Saturdays. The bustling market offers fresh fruit and vegetables, preserved foods, ethnic ingredients, unique local delicacies, and freshly-prepared street food. Originally a thermal plant, Rockwell Centre was built as a high-end mixed-use area for residential, commercial, and educational purposes. Its high-end condominium buildings have attracted the attention of Manila’s wealthy families as well as some of the expatriates who work in the surrounding areas. Development of Rockwell's high rise condominiums is ongoing. The Power Plant Mall, its commercial centre, has a supermarket, several luxury boutiques, pricey restaurants, a food court, and a 6-screen cinema. It is surrounded by upmarket residential apartment buildings. The Ateneo Professional Schools, which houses some of this prestigious school’s postgraduate courses, is located here.